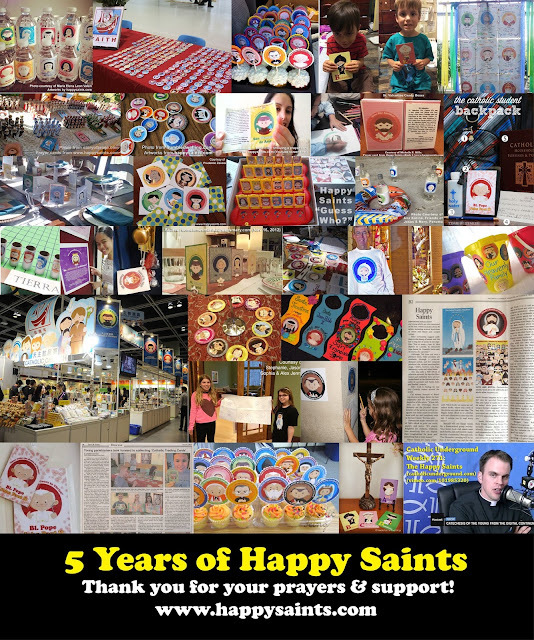 Happy Saints: 5 Years of Happy Saints! 5 Years of Happy Saints! It has been 5 years since I created the first Happy Saint artwork and started the blog gallery on 7 August 2010. Since then, the artworks have been seen and used by families, schools and churches all over the world, thanks to the power of the internet and social media. I thank God for giving me the grace and opportunity to be involved in this new evangelization effort. I also thank all of you for your prayers and support, which have kept this project alive and widespread. May the Saints of God continue to inspire you and help you towards the path of holiness!